Peru wants to forge closer trade ties with Vietnam as the South American country begins looking for investment opportunities in Southeast Asia, according to a press release issued by Peru’s foreign trade association Comexperu. The release said that Vietnam “is a very interesting market for closer trade relations and to make capital investments from one country to the other”. 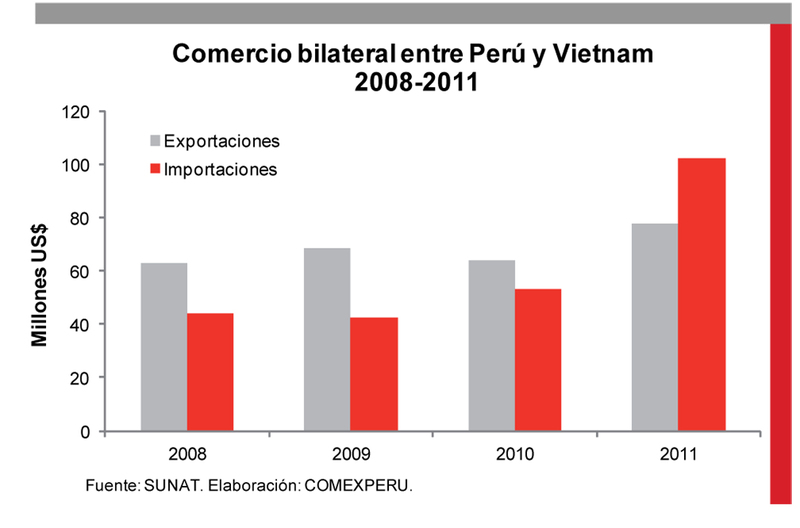 Peru also aims to reach a bilateral trade agreement with Vietnam. “We must seize the opportunity to improve our relations with Vietnam, a member state of the Forum of the Asia-Pacific Economic Cooperation (APEC) and the Trans-Pacific Partnership Agreement (TPPA)”, the release said. In the first five months of this year, Peru exported $50 million worth of goods to Vietnam, an increase of 79 per cent from the same period last year, according to Comexperu statistics. The highest Peruvian sale volume to Vietnam was that of fishmeal and fish oil, for $38.8 million and $697,792, respectively. Products from Vietnam exported to Peru were mainly footwear and frozen fish for a total value of $102 million in 2011. The release also stated that the 88-million population of Vietnam offers a large market for Peruvian products. Furthermore, the release pointed out that the countries of Colombia, Indonesia, Vietnam, Egypt, Turkey and South Africa are forming the new trade bloc of CIVETS, which is seen as the successor of the BRIC bloc (Brazil, Russia, India, China) and is expected to grow significantly over the coming years.